Fixed or revolving slatwall is the most sought-after display tool for generating non-casket revenue. 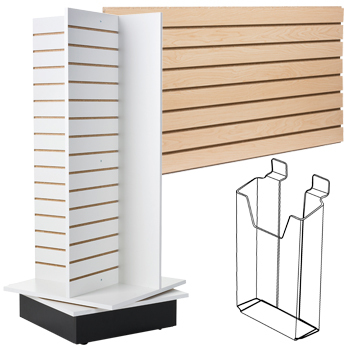 Panel systems in plastic, wood finish, and MDF Anchor® Board Core save space in small showrooms, and create interest in featured gift store merchandise. Free-standing or countertop easels enable families to mount a photo montage or treasured photograph from home. 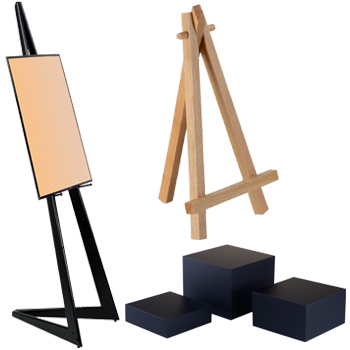 Folding easels in wire, wood, and acrylic are easy to transport and store. Shop our complete selection of acrylic display risers, pedestals and tripods for setting off an urn or gift merchandise. Create a comfortable reception area in your showroom where guests can mingle with relatives and learn about your services. Padded seating in soothing blue, burgundy, charcoal, and green eases funeral planning stress. Faux granite and oak end tables hold business literature or books on coping with grief. Clients want to celebrate the life of their loved one with digital slideshows and they want to give flawless eulogies. These iPad pulpits and holders support both! Remember, you can use tablet stands to promote your business with social media and digital advertising presentations. Or, set up interactive displays in a gift shop for point-of-sale checkout. With 2.4 million funerals taking place on average annually, and the likelihood that immortality will elude humans into eternity, few professionals enjoy as much job security as those in the funeral industry. People will spend about $20 billion on 2.4 million burial and memorial services next year; and sure, you’ll always be in business! But even in a niche industry like this one, real success requires a commitment to creativity and innovation; to stay truly competitive, you have to be current. So it behooves every funeral director to stay ahead of the curve with frequent industry research so services and products reflect fresh perspectives and modernity. Customers will gain the most comfort with informed staff who demonstrate they can effectively pull out all the stops to tell the unique story of their loved one. You know better than anyone, a funeral director wears two hats; one is the same hat worn by medical and psychology professions -- the empathy hat; the other is the savvy salesman hat worn by marketing managers driven to meet bottom line projections each year. Balancing emotional intelligence with business sense can be tricky, but funeral shops who do this will be rewarded with happy customers. Another things to think about; operating on auto-pilot never built a brand whose name anyone could remember. But staying current and engaged in industry dynamics guarantees customer confidence, and that’s how funeral furnishing and accessory businesses gauge success -- are their customers loyal, will they spread the word about their good service to others. Whether it’s offering “green” burial services, or helping clients through the process of donating a body to science, funeral homes need to show their clients they have done their homework by offering a breadth of reputation-securing services instead of relying on worn and traditional templates. It is no different with the merchandise you’re selling. Can you offer custom cremation jewelry and a display to put it on? These are the questions you’ll want to say “yes” to, to guarantee a top slot in the marketplace - and that’s where we come in. This online shop offers a vast supply of thoughtfully designed, modern, carefully vetted products to assist your funeral business in doing its job well. Our online store is as committed to innovation as you are, and we know your industry almost as well as you do. Shop our site exclusively to find the latest and greatest in funeral furnishings and product displays. Whether it be slatwall shelving and panels, risers and platforms, digital media kiosks and lecterns, floor standing and countertop easels, or reception and guest furniture, we have the tools you need. In addition, we offer picture frames, customized banners, and parking stanchions, as well as flag displays and shadow boxes. Our large inventory supplies to outfit your business and make it completely current will help you generate non-casket revenue. From there, funeral home personnel can focus on the service part of their jobs which helps the grieving bury the deceased with dignity, and celebrate their lives with compelling memorials. Slatwall Panels & Accessories: With trending merchandise comes the need for a way to display it. Cremation jewelry is all the rage - does your gift store have a proper way to showcase it? Even urns have a new twist - they are being offered in 3-D memorial configurations to reflect the unique personality of the deceased. What better (and more affordable way) to present them than to use the popular slatwall shelves and panels that are easy to adjust. Funeral home items like military flag holders, books on grief and bereavement, or personalized plaques and banners can all be displayed using this popular and space-saving grooved wall system. Offered in wood finish, MDF board, black or clear acrylic, the see-through version causes the featured product to "float" in mid-air, which is sure to catch the attention of even the most distracted customer. Tabletop & Floor Standing Easels: Photographs have always been key in memorializing the deceased, and that will never change. A photo gallery of somebody’s life is often the focal point of a service. Folding easels are portable and people will use them for photographs brought from home; if they buy them from your store they will be able to use them for other purposes at home later. The countertop and freestanding easels provided here come in numerous shapes, sizes and materials from black and clear acrylic to wire; in addition, we offer risers and pedestals to spotlight an urn, guest registry or vase of flowers and other funeral home items that you can sell to make non-casket revenue. Reception Furniture: Does your place of business feel welcoming to new clients? Make sure your décor is subtle, and highlight merchandise for sale in understated ways so as not to project a “salesy” vibe to new visitors who hope to find direction and relief, not clacking cash registers. A soothing, flowing seating area and décor with padded chairs supports physically and psychologically. Comfort those tired from grieving and planning with padded seating that features a back rest, in understated classics like blue, burgundy, charcoal, and green. 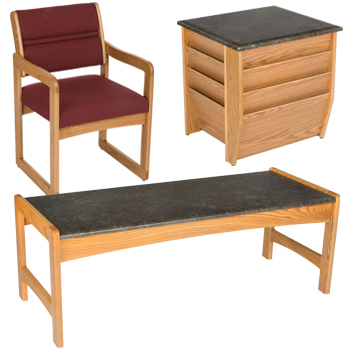 Complementary faux granite end tables in light and medium oak are sturdy and attractive holders for business literature or books on coping with grief to comfort and inform clients as they wait. In all, you want to portray support both practically and metaphorically when selecting furniture for your funeral home. 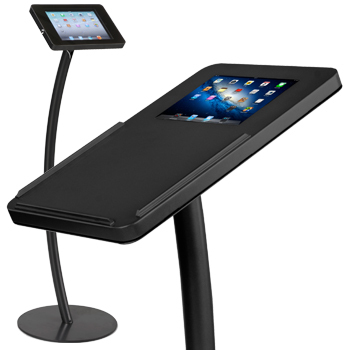 iPad Pulpits and Holders: With social media changing the way we communicate, interact, buy, sell, live ... even die, interactive media stands are an essential fixture in any funeral home. No doubt your business has fully implemented social media into its marketing plan and perhaps you have even loaded presentation onto an iPad in your showroom. All of your inventory should be reflective of the research you’ve done. Are you prepared to steer customers through the process of a “green” burial? If not, now would be the time - your knowledge of them will appeal to environmentally-conscious, often younger clients. Offering video services is sure to appeal to those seeking traditional funerals as well as less conventional ones. Offering digital slideshows against a backdrop of music is another services most customers expect to see. Don’t forget these technology kiosks can also be used as point of sale fixtures for convenient checkout. Your clients may want to use them to give a eulogy in a church or chapel. With features like rotating brackets, locking enclosures, a ledge for notes, and integrated cable management, these touchscreen stands come in black, white, stainless and other color combinations and support all iPad generations, including Air. The profoundly emotional nature of the funeral business must be balanced by the practical business side in order for a funeral home to enjoy success. Customers may face a bill in the vicinity of $8,000 or $10,000 when all is said and done -- that's the typical cost for a funeral in the United States. For that price, expectations are high - and we want to help you exceed them. The emotional pain and practical stress of burying a loved one can be eased by dedicated funeral home professionals who have the right marketing tools in their hands, a current viewpoint, and the right blend of merchandise and services to honor the deceased by telling their unique story. If you provide all of these things to customers, they will reward you by spreading your good name around the community. That guarantees repeat business for years to come -- the true measure of success in the industry that never runs out of business.